Designer home w/hot tub and gourmet kitchen, SHARC passes! This is a gorgeous Sunriver home right on the Woodlands Golf Course with great views of the fairways. It has a private hot tub, a gourmet kitchen, and eight available SHARC passes! Day trips to tourist darling Bend (17 miles away) and skiing mecca Mt. Bachelor (25 miles away) are both easy. As you walk into the home, it has a den and a nice TV and a DVD/VCR combo. To the left of the front door there is a large laundry room and office (don't worry, business travelers, WiFi is available). The dining room has seating for eight, and the gourmet kitchen is a cook's dream, with large granite countertops, a gas range, and stainless-steel appliances. A private hot tub outside lets you soak away your cares after an active day. Also on the deck, there's a gas grill for preparing your fresh-caught fish to flaky perfection. If you feel competitive, there's a Ping-Pong table in the garage! There is a king master bedroom with a TV, plus a bathroom with soaking tub and stone-tiled shower. Down the hall is the king bedroom, which shares a Jack-and-Jill bathroom with the queen bedroom. The home has a hot tub which is accessed from the living room. This comfortable home will sleep up to eight guests. Get ready for the trip of a lifetime at this luxury Central Oregon vacation home! Parking Notes: Please park vehicles in the driveway or garage, only. Roadside parking is not allowed anytime/anywhere in Sunriver without prior approval from the Sunriver Police Department. To request special permission for overflow street parking, please call (541) 593-1014. Overnight requests will not be granted. Thanks for considering a Vacasa home! We provide full-service management for privately owned vacation homes, and like to think that we offer our guests the best of both worlds: the unique experience of staying in a one-of-a-kind vacation home, with the peace of mind that comes from knowing that the home you book for your special vacation is cared for by professional housekeepers and property managers. <br> <br> Vacasa began in 2009, simply because our founder and CEO Eric wanted to find a better way to share his wife’s family���s summer home in Long Beach, Washington with guests as a vacation rental. Eric and his early team worked to build Vacasa on the premise that local employees can do what they love most (taking care of guests, homeowners, and properties), while the hands-off tasks of vacation rental management—things like marketing, filing taxes, and maintaining a website—could be handled by a specialized central support team. <br> <br> Our passion is connecting travelers with the unique experience of staying in a vacation home, and we would be honored to be your host. Please contact us with any questions about this home—our team is standing by! My husband and I, our daughter and son-in-law, and nearly 3-year-old grandson spent a week in this lovely home for a snowy ski vacation. My daughter and I both love to cook and really appreciated the large, well-equipped kitchen, which included two sinks, an additional small fridge, a wine cooler, and spectacular pantry. Both automatic drip and Keurig coffee makers were included. Having the bedroom suites at either end of the house gave great separation for noise and privacy. The den provided some quiet space for a couple of long business phone meetings my son-in-law needed to have, with well functioning wifi. The cable TV allowed for access to Netflix and Amazon for streaming movies, which many Sunriver vacation homes don’t have...a real plus for our grandson. The basketball hoop in the driveway got our grandson pretty excited and he is eager to return during warmer weather so he and his dad can use it. The bedrooms and bathrooms were comfortable and well designed. As we have found in all Sunriver rental homes, there really isn’t good lighting for reading, but we’ve learned to bring book lights, so that wasn’t a problem. We loved our stay in this home and plan on a return visit during the summer. Perfect layout for grandparents, parents, and grandson...and a GREAT kitchen! My husband and I, our daughter and son-in-law, and nearly 3-year-old grandson spent a week in this lovely home for a snowy ski vacation. My daughter and I both love to cook and really appreciated the large, well-equipped kitchen, which included two sinks, an additional small fridge, a wine cooler, and spectacular pantry. Both automatic drip and Keurig coffee makers were included. Having the bedroom suites at either end of the house gave great separation for noise and privacy. The den provided some quiet space for a couple of long business phone meetings my son-in-law needed to have, with well functioning wifi. The cable TV allowed for access to Netflix and Amazon for streaming movies, which many Sunriver vacation homes don’t have...a real plus for our grandson. The basketball hoop in the driveway got our grandson pretty excited and he is eager to return during warmer weather so he and his dad can use it. The bedrooms and bathrooms were comfortable and well designed. As we have found in all Sunriver rental homes, there really isn’t good lighting for reading, but we’ve learned to bring book lights, so that wasn’t a problem. We really loved our stay in this home and plan on a return visit during the summer. Great stay, open kitchen to living. only cons: lighting and entertainment system very confusing/not working. We really like staying here. Sitting on the patio and looking at the golf course was nice and it was fun watching people Tee off. Also, we really liked the fact that the house, although large, it was all single story. And we liked that the master suite was quite a distance from the other bedrooms providing privacy for the two adult couples who were renting this house together. 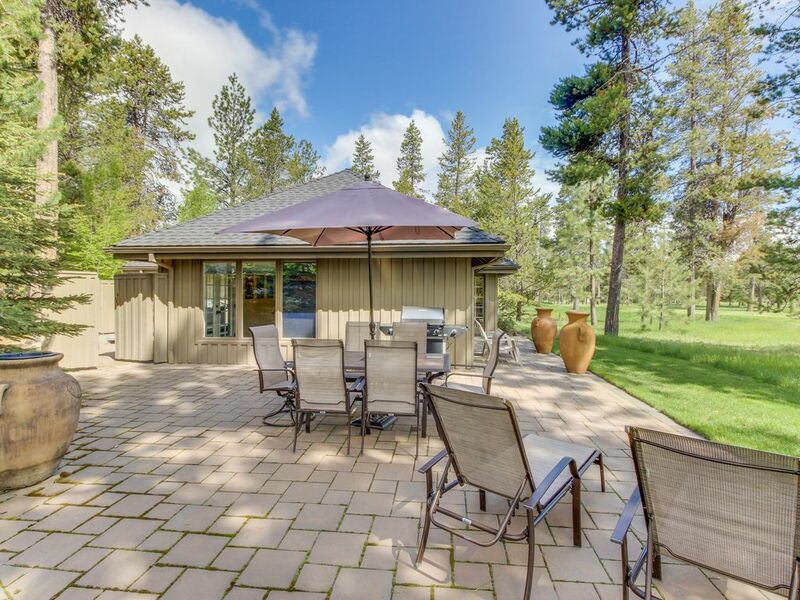 Lovely golfcourse home in Sunriver! Our family with 3 kids plus one set of grandparents returned to Sunriver, OR for the 2nd time in 2 years. We love all the bike riding and river activities. Also the golfing! This house was as lovely in the pictures as it is in person. We enjoyed sitting out on the patio for meals or even just coffee while watching the golfers tee off on the 8th hole (Our kids enjoyed playing around on the course at dusk as well!) The house has a master bedroom that is very separate/down a long hallway which was nice. The other 2 bedrooms share a jack 'n jill bathroom. The family room/tv area was very comfortable for our larger group and the kitchen was also spacious. If we came to Sunriver again, I think we'd look to stay in this home again! Sunriver is beautiful once you manage the circles:) The rental property was nice; outside was beautiful being right on the golf course. It was very difficult to open the windows and it would have been nice to have them open because the weather was so fabulous. It was not as clean as we would have expected and the bedspreads did to seem to have been cleaned. All in all it was a wonderful trip with great bike riding and fishing. We are happy to hear that you enjoyed the home. We will make sure that the local property manager knows about the windows and cleanliness. We hope to be able to host you again in the near future.